Whelp. I’ve only waited ten months for this thing to finally. Frickin’. Show up in my Steam library. To be quite frank I’m not all that stoked anymore. I would rant and rave about how pissed I am, but, of course, I already have that covered. Anyhow, let me try to write this with as little bias as possible. That is, if I can even stand a chance with uoou. 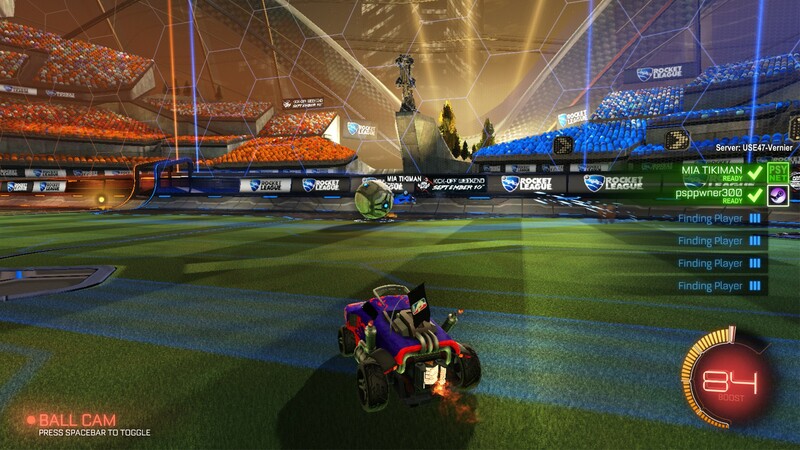 Rocket League is the sequel to Supersonic Acrobatic Rocket-Powered Battle-Cars (AKA SARP Battle-Cars) for the PlayStation 3. 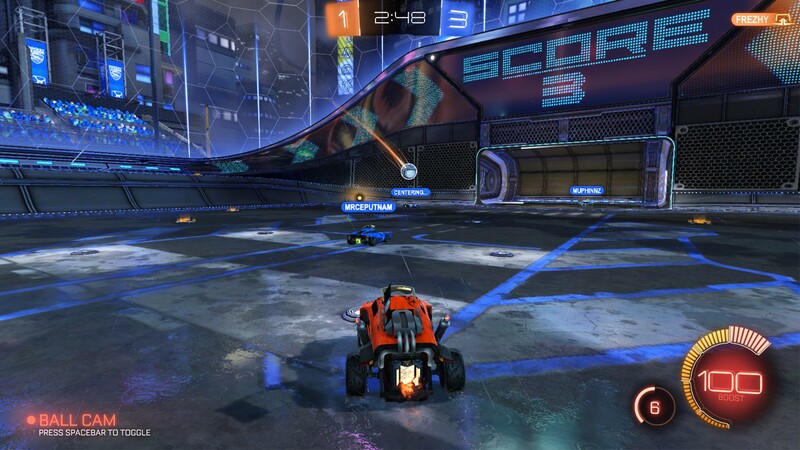 Seeing as the first game wasn’t a very good success, Psyonix, the developer and publisher behind both games, looked to address some of the issues that were presented, while still maintaining much of the core of Battle-Cars: you’re in control of a remote-controlled car in a soccer/football field, and the goal is simple: knock a ball into the goal, while preventing the opposing team from doing the same thing. It’s basically soccer (or, what most countries would call football) with RC cars. These cars can be customized to your liking, whether you like a monster truck with flaming red flames or a limousine with simple design and elegance. Much of the DLC actually has additional fancy-looking cars from which you can purchase (I’m probably going to wait until there’s a Game of the Year edition, as none of the DLC actually expands the gameplay itself). Your car has a boost gauge that will fill up as you collect orange patches on the ground and drain as you use it. 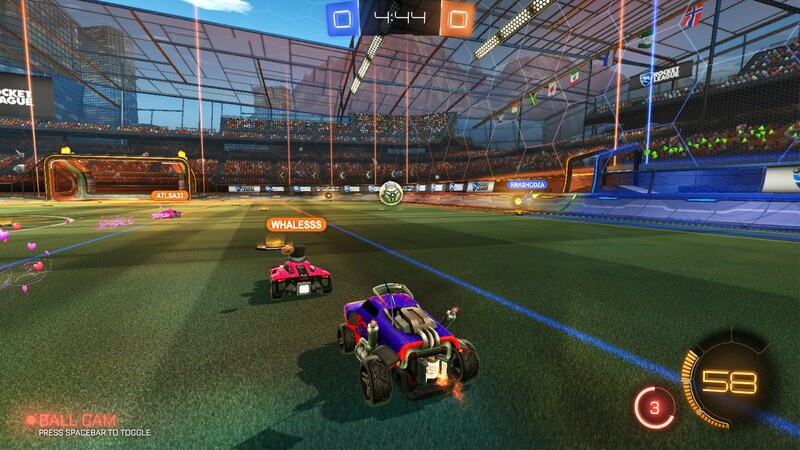 These boosts give the game a little bit more complexity as cars can rush to their side to prevent a goal, add a little more knockout force when hitting the ball, or lifting yourself up into the air for an air hit. Or, if you’re like me, if your car goes fast enough you can run other cars over, forcing them to respawn to a random location. In addition, the cars can do frontflips, backflips, and sideflips to ensure a more accurate shot. Now Rocket League is currently among the top ten highest-player-count games on Steam. I’m honestly not much into the game myself but I certainly understand why it’s so popular. In fact, it’s considered to be an eSport, with tournaments every weekend. Free updates have given Rocket League increased value. Many settings can be modified, called “Mutators,” that allows one to customize the way the game works — the ball size can be increased or decreased, the gravity can be changed, boosts can last forever, and many, many more options. In December of 2015 the game received a hockey-like theme called “Snow Day,” in which the field is an ice rink and the ball is this big puck. Personally, this is my favorite mode. Some time later in April of the following year the “Hoops” mode was released, with a beautiful basketball-themed court with giant half-hoops as the goals. From my experience it was fairly frustrating to get the ball into the goal. 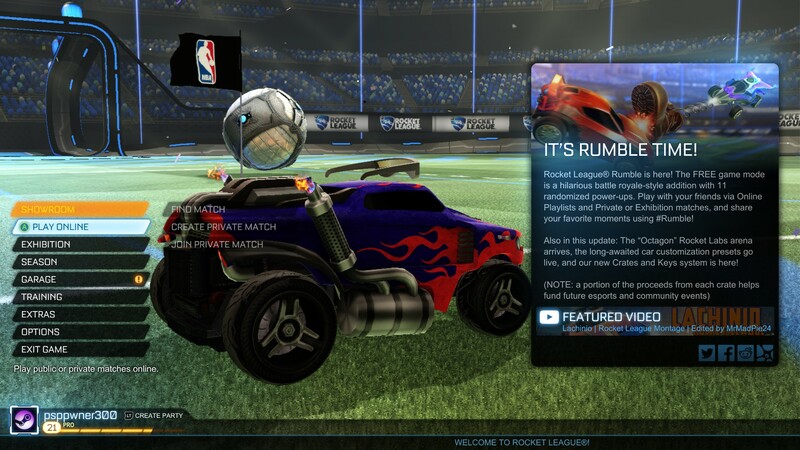 And just yesterday we received the “Rumble” update in which you will receive a random power-up every ten seconds that can be used to your team’s advantage, whether it be spikes to keep the ball with you or a toilet plunger that will gravitate the ball towards your location. In this update we also receive micro-transactions, and while that will immediately sound off-putting to some, this a) apparently will fund future eSports events, b) is purely for cosmetic purposes, and c) can be turned off in the options menu. The biggest thing for many of us reading this review, though, is the Rumble update also shipped with Mac and Linux versions. Even though they’re both currently in beta phase, I have to say, as far as the Linux version is concerned it actually runs pretty good. While the developers seem to make SteamOS support their top priority, it should run just fine on any other distribution. It ran. It actually ran. Like, Rocket League on Linux? I thought it would never become a reality. But it was actually running just fine, on my Mint distribution. The biggest hurdle I think for most everyone, as a problem you’ll see with a lot of games, is that Steam Cloud did not pick up my save file from Windows. So I had to manually transfer my save from Windows to Linux to have my custom car with decals and stuff (PCGamingWIki will tell you where the save paths for each operating system is). Port quality is pretty good. I couldn’t max the graphics options and get sixty frames-per-second, so I had to lower the quality level a bit, but still. My Xbox controller was picked up just fine; no extra configuration was needed. Some footage below. Amazing to think that at six o’clock in the morning, almost 50,000 players are online. Please excuse the occasional choppiness. I think we can finally say goodbye to all those Reddit posts asking, “Wh4t’s go1ng 0n w1th R0ck3t l3agu3 GUISE? ?” I can’t believe that after ten months I’m actually saying, “It’s on Linux.” No, seriously. It is. Just try it yourself. Not saying I’m too happy with how long it took but I guess I can finally stop taking these mind-altering substances. I look forward to playing with some of you folks. I’d given up on RL coming to Linux to the point where I’d removed it from my wish list ( Yea I was really showing ’em ;P ). When it suddenly made an appearance I bought it immediately despite being completely broke and in the red that week XD (I’d told them I’d buy it if it came out on Linux and by golly I was gonna prove I was a man of my word); and yea damn good port it is too.